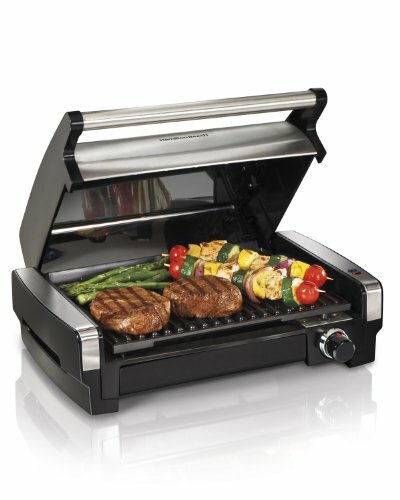 What is an Indoor Electric Grill? Have you ever been in a position when you were unable to grill your chicken because of some reasons? Either because your condo or apartment does not have a backyard, the weather is bad or because cooking outdoors is prohibited in the city you live in. 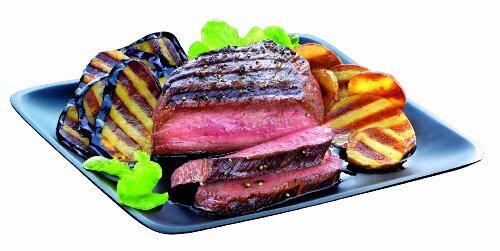 Cooking on a grill is easy, healthful and tasteful method to prepare food, and almost anything can be cooked on it. 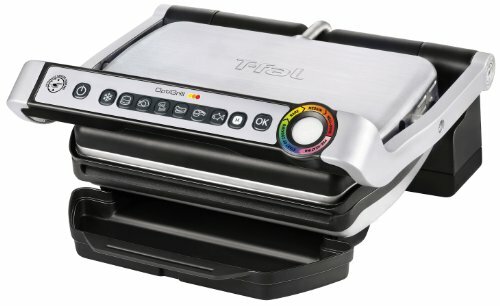 If you have a desire to grill outside but you are limited for some reason, then the best thing to do is get an indoor grill to satisfy that desire. 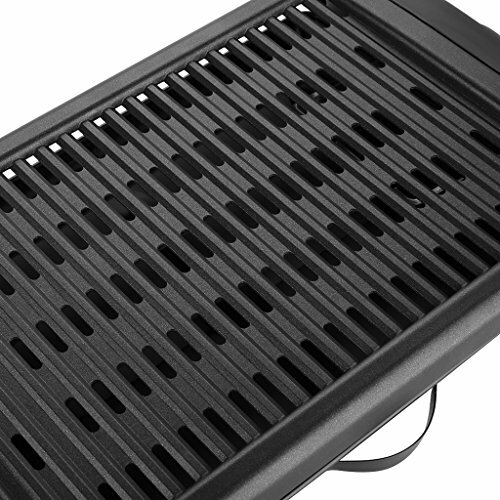 As the name implies, it is a grill that is designed to be used indoors. 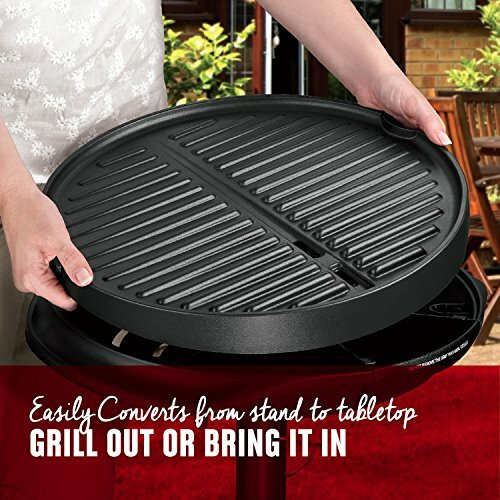 They make grilling a lot easier because they can be placed on a counter or tabletop for safe operation and they donât take much space in your home. 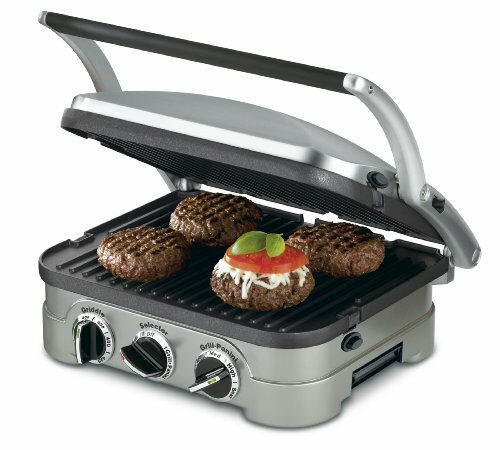 You can cook just about anything on an indoor grill. No matter how good or bad the weather is outside you can safely cook your favorite meals inside the comfort of your home. 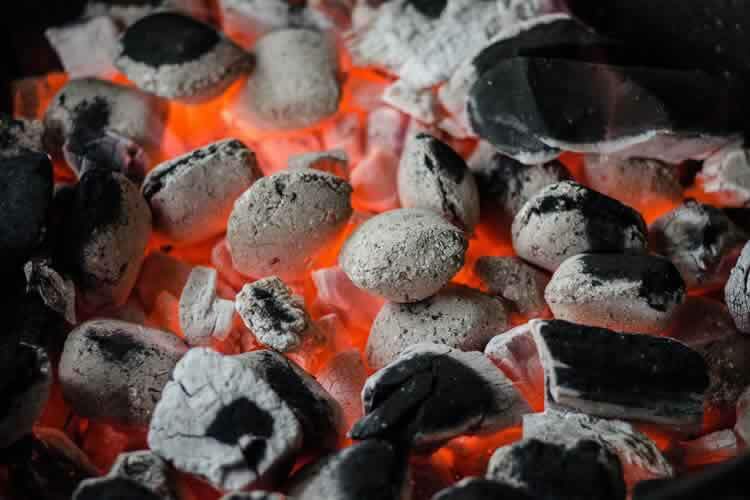 Indoor grills run on electricity, so you donât have to worry about dealing with messy charcoal or refilling a propane tank. 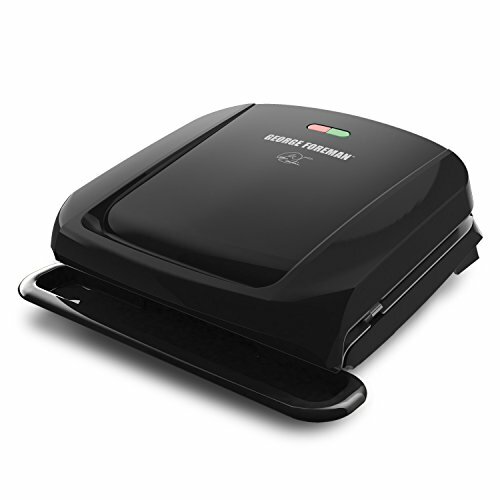 While using an electric grill, you might not get the same flavor as you would with a charcoal grill, but you can get something that is quite tasty, and you can easily cleanup after use. 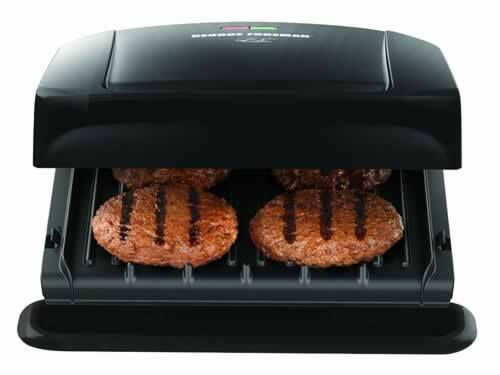 Electric grills are also useful during bad weather conditions, you just stay indoors and grill your tasty chicken. 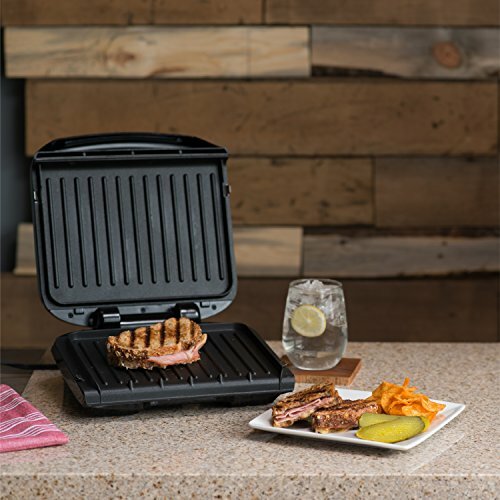 This indoor grill comes packed with six cooking options: contact grill, full griddle, half griddle, top melt, half grill and Panini press. Just choose the one you want and start cooking. 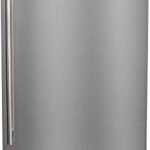 It is coated with a stylish Brushed stainless steel for durability. 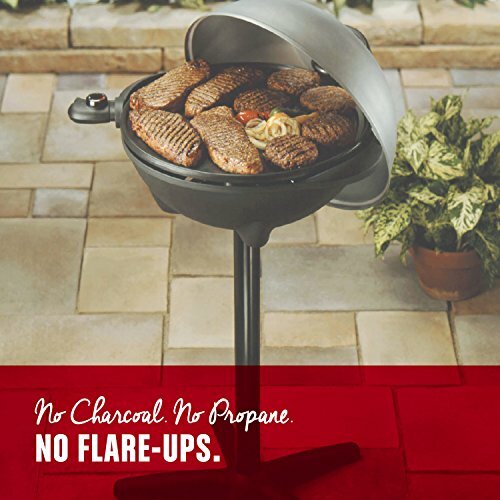 It also has a SearBlast feature that sears at 500Â°F for up to two minutes at a time, it helps lock in the flavor of steaks, fish or poultry. Its cooking surface is 240 square inches open, this is a pretty large surface when cooking meals for the entire family. 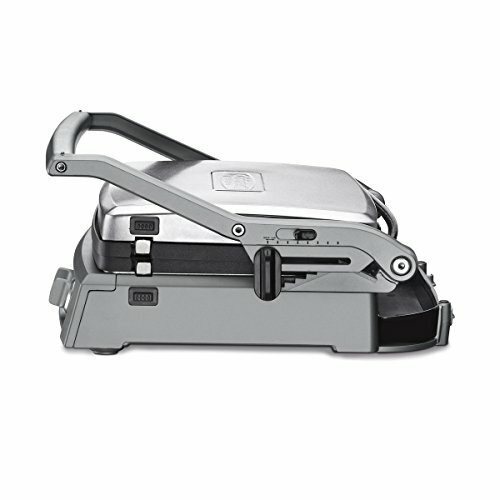 It has an adjustable top cover with 6 preset height positions that can be adjusted to melt and lock for storage. 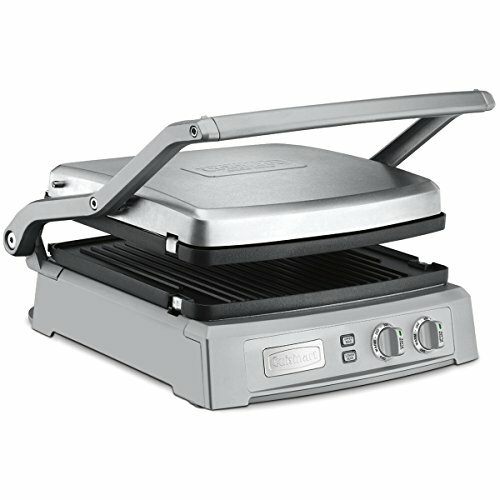 The George Foreman GRP1060B was designed with durable coating, so you have no worries of it going bad anytime soon. 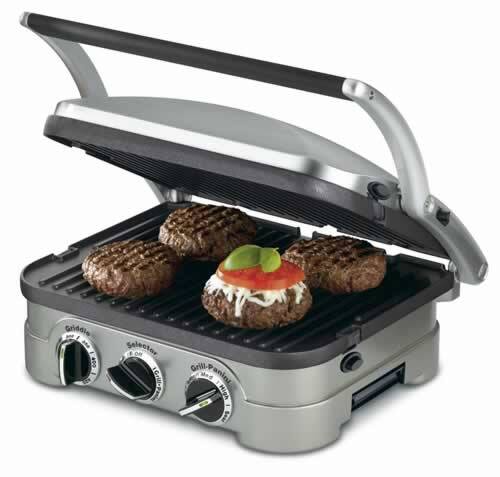 Its 60 square inch cooking surface ensures it can carry up to 4, one-quarter burger patties. 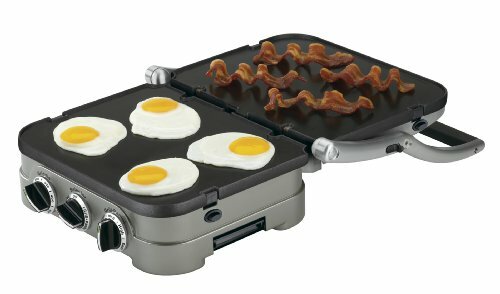 It can cook up to 4 servings at the same time. 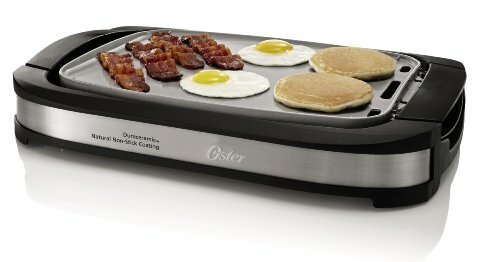 There have also been reviews by customers that it can cook meals in just 10 minutes. 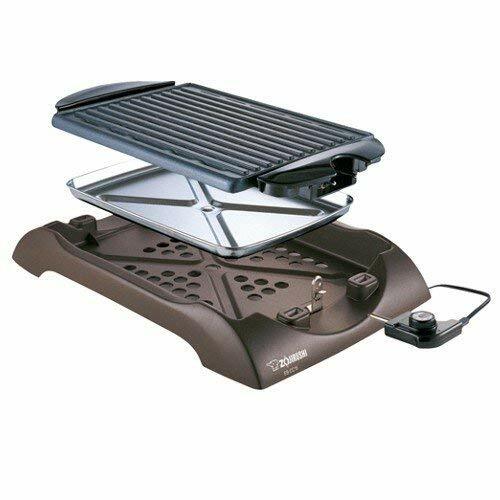 This grill can heat up 35% faster than previous models, so be happy when this model grills your chicken or vegetable until it is well cooked and leaves you with a delicious taste. 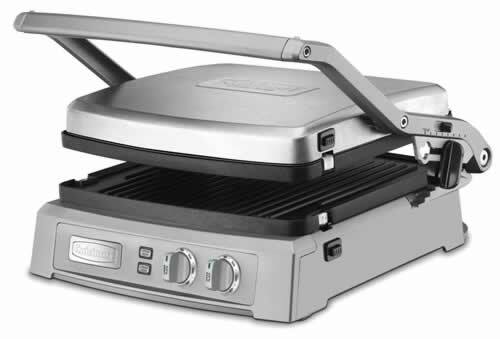 One added bonus it has, is that it has a hinge that allows the grill cover adjust to the thickness of the food. 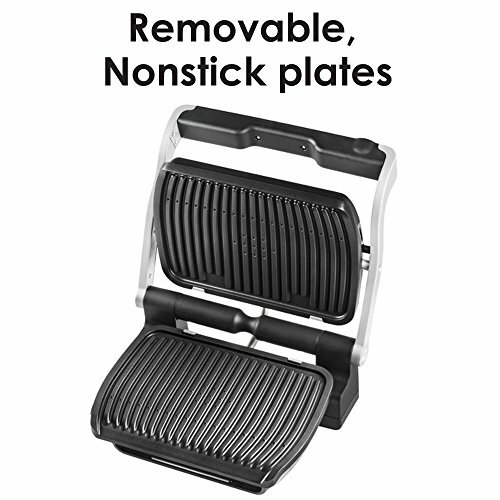 It also has a dishwasher which allows you safely remove the plates. 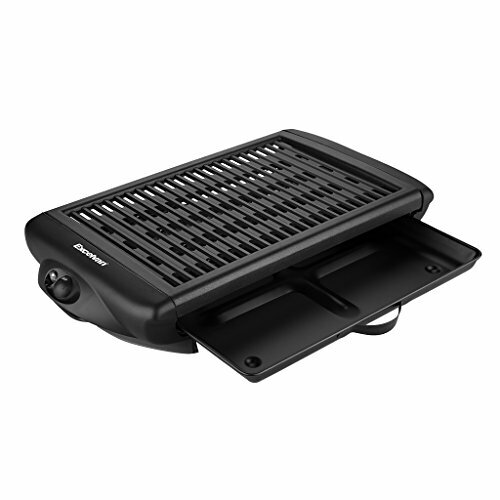 The manufacturer of this grill offers a one-year limited warranty, this ensures you are covered if there is any defect on the grill, you can just as easily return it. 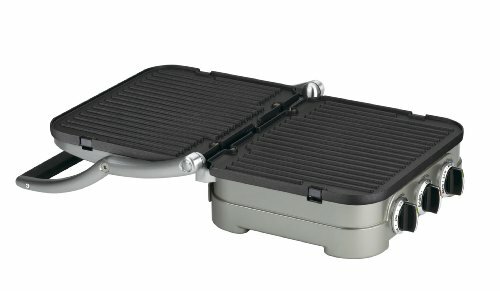 This grill was designed with a unique Dura Ceramic non-stick coating (PFOA and PTFE free) that last four times longer than the standard non-stick coatings, so you can griddle pancakes, eggs and more without worry. 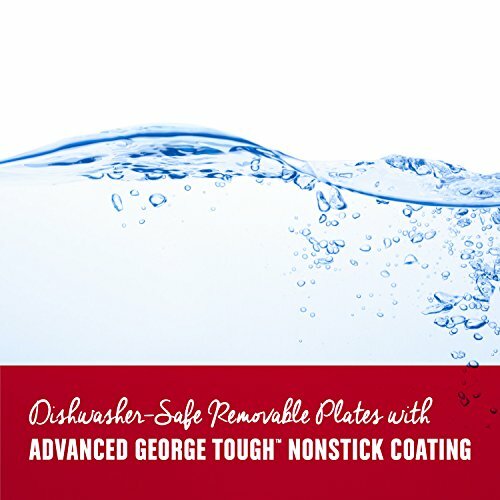 The cooking plate is fully detachable and is dishwasher safe, and can be cleaned with ease. 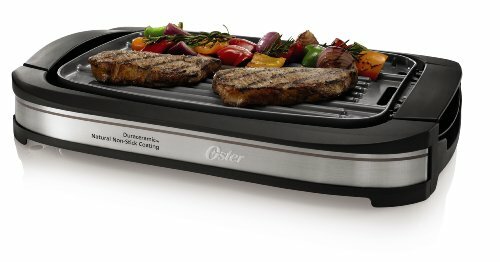 It also heats up 20 percent faster to get you cooking your meals quickly and easily. 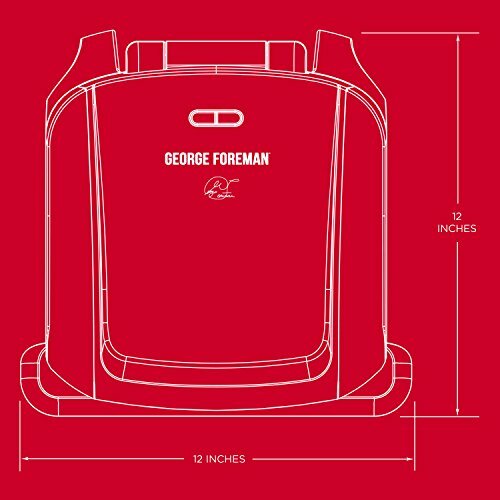 You can conveniently prepare meals for the whole family with its 10-inch x 18-inch cooking surface. 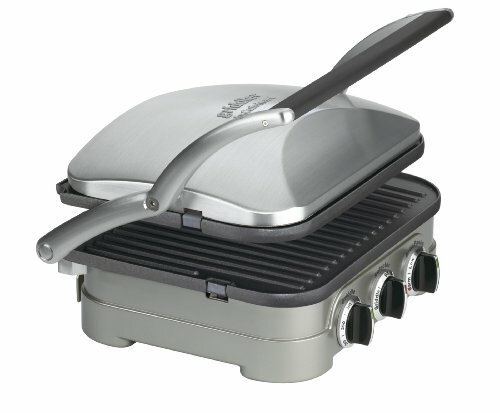 Hamilton Beach allows you to use it as both a grill and press to give you optimal cooking experience. 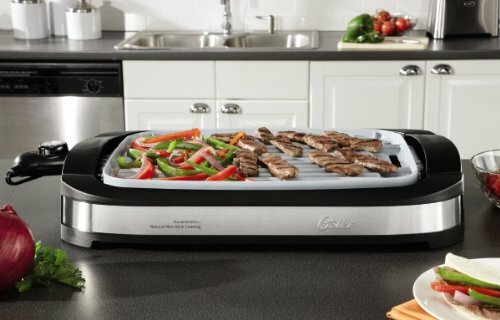 The 120 inches cooking surface allows you to fit up to eight servings at the same time. 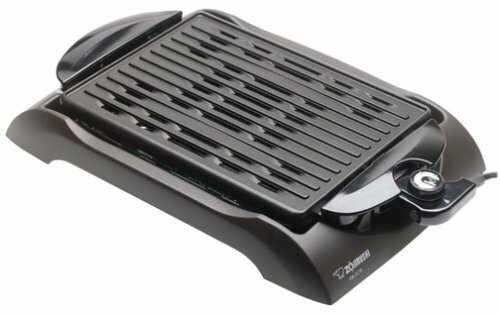 There have been user reviews that this grill is easy to set up, easy to use and incredibly easy to clean. 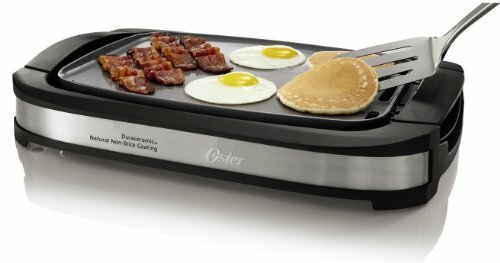 It has heat searing capability and adjustable temperature control that heats up your food in the right temperature leaving you with a yummy taste at the end. 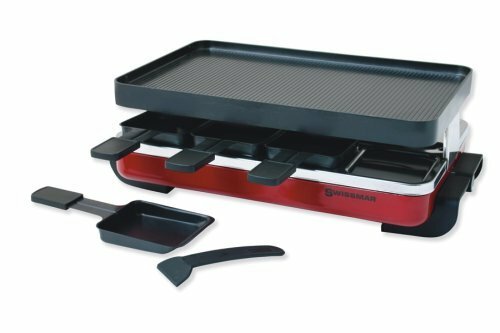 The grill plate, drip tray and removable hood are dishwasher safe. 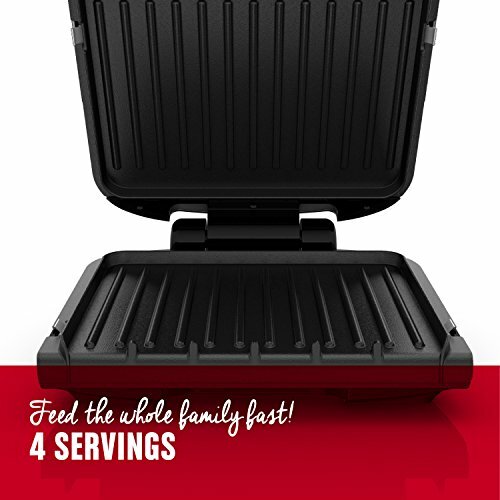 This grill has 6 pre-set cooking programs for Fish, Sandwich, Red Meat, Burger, Sausage and Poultry. 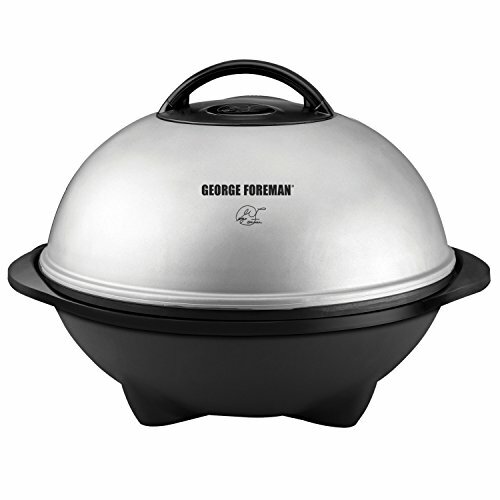 The indicator lights and audible beeps allows for easy monitoring of the cooking process. 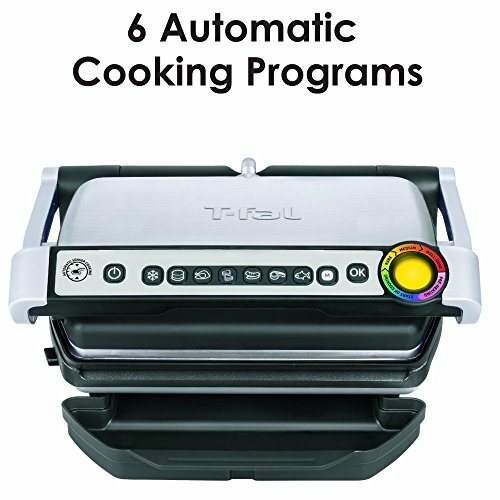 Together with the six automatic programs, the grill provides two additional cooking options: Frozen mode for defrosting and fully cooking frozen food and Manual mode for cooking vegetables or personal recipes. 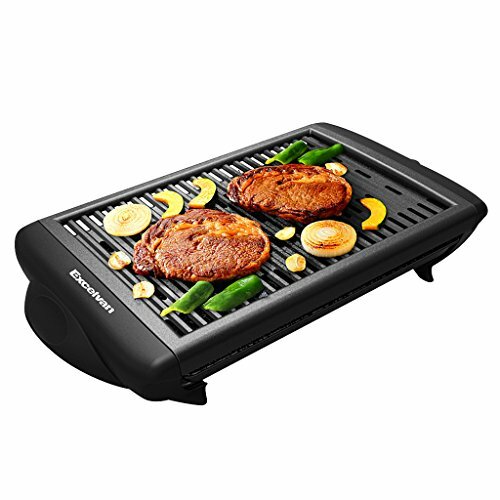 It also comes with a precision grilling technology with sensors which measures the thickness of food for automatic cooking based on the program selected. 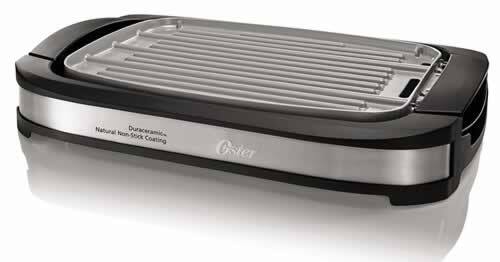 The OptiGrill features a die-cast aluminum plates with a nonstick coating for effortlessly food release, user-friendly controls comfortably located on the handle and a powerful 1800-watt heating element. 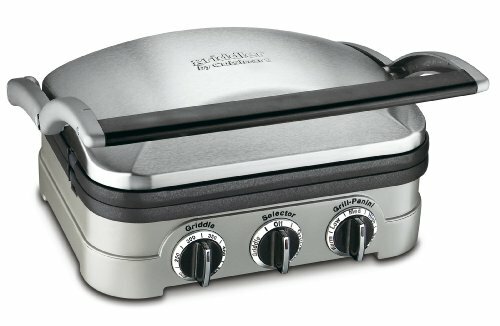 Talking about how good warranties can get, the Cuisinart comes with a limited 3-year warranty. 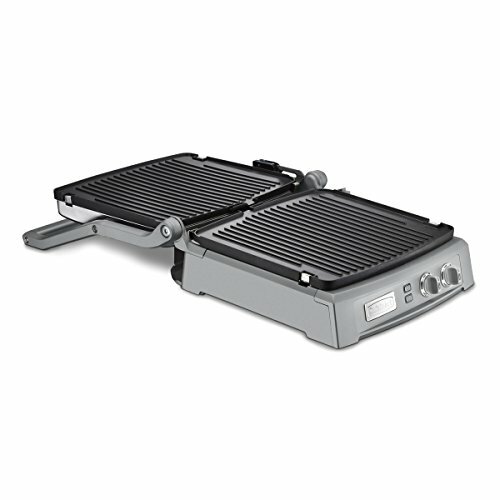 The counter-top Griddler offers a 5-in-1 functionality as a contact grill, Panini press, full grill, full griddle and half grill/half griddle. 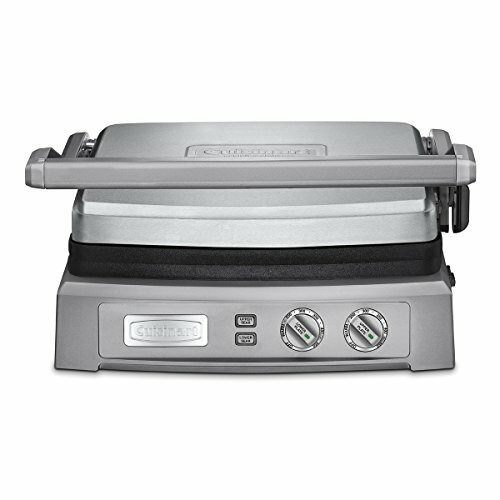 It looks sleek and modern with its stylish brushed stainless steel housing and features a sturdy Panini-style handle, and a floating cover that adjust to thickness of food. 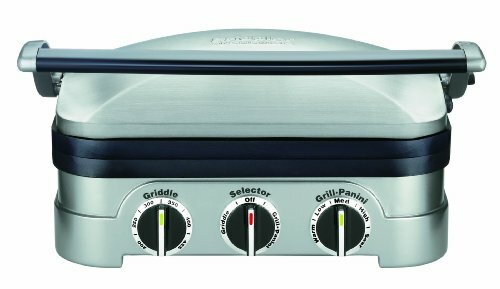 It also features adjustable dual temperature controls and the indicator lights makes cooking with it a lot easier. 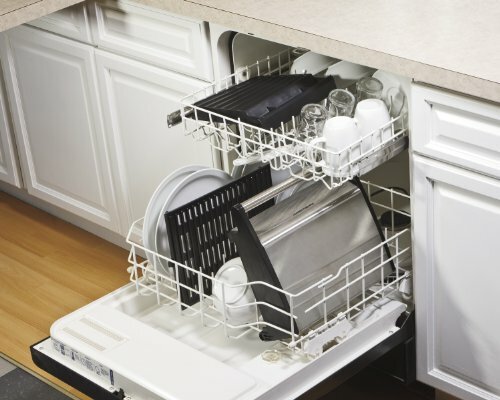 The cooking plates, drip tray and scraper all go safely into the dishwasher. 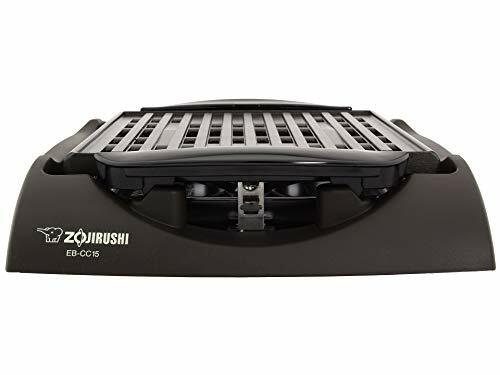 The Zojirushi is coated with a non-stick 12 by 9 inch cooking surface and has a 1300 watt heating element for effective grilling. 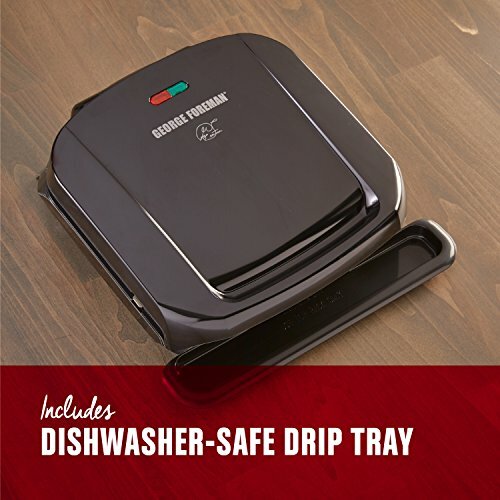 You can disassemble it easily for cleaning and the drip tray is dishwasher safe. 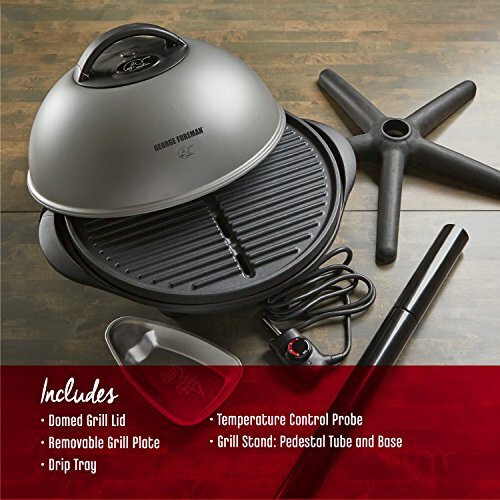 It features a variable heat control which provides precise cooking temperatures, and the grillâs handles made of a stylish dark-gray plastic base stays cool during the grilling process for your safety. 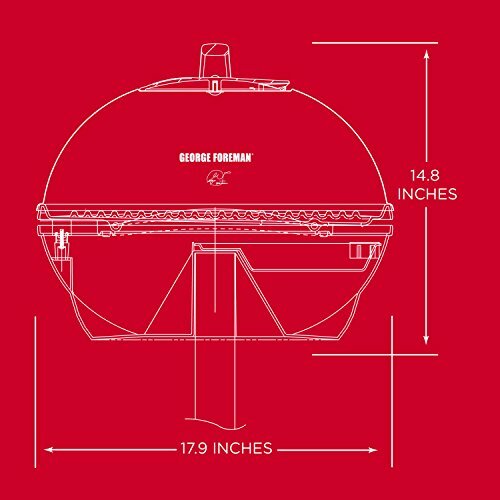 The user manual of this grill takes you on a step-by-step process of how to use it, so you wonât find yourself running into problems. 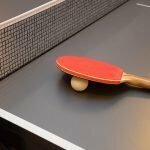 The manufacturers offer a 1 year warranty and their customer service is superb. 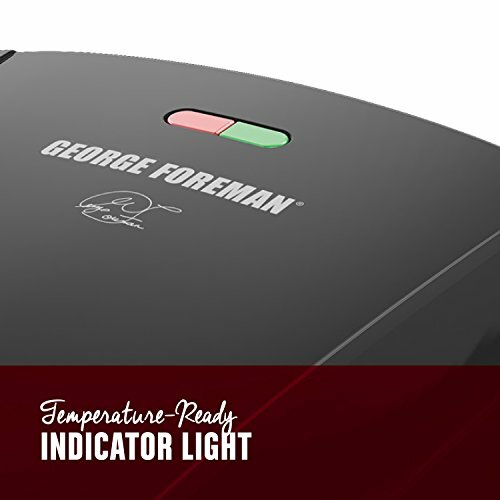 It allows you adjust the temperature to the required temperature for different types of food. You can also disassemble it easily for easy cleaning. 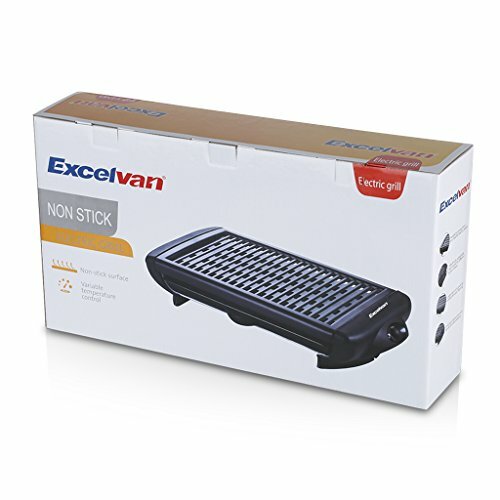 Excelvan also features a 15×10 inch cooking surface which allows for multiple cooking at the same time and is useful for a variety of meals. 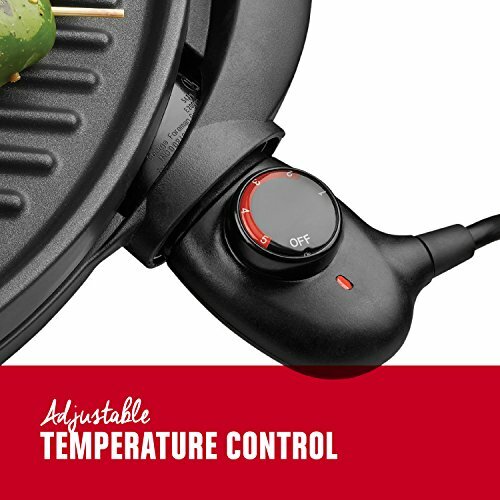 TEMP ADJUST : The electric heat has an adjustable range from low (For keeping food warm) to high (For searing steaks),which can be adjusted to your required temperature for different food. 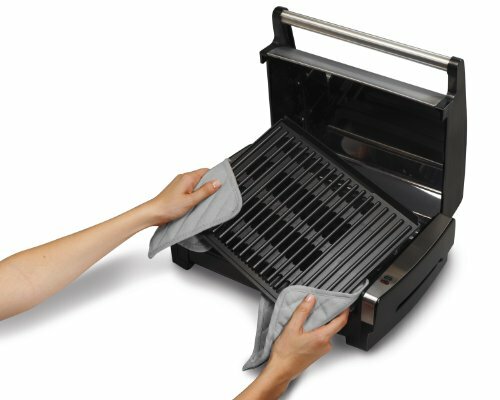 REMOVABLE DRIP TRAY SAFE : The removable and nonstick drip tray collects drippings, put some water into the drip tray while grilling to avoid oil cooking fumes, dry, peeling and make it easier to clean. 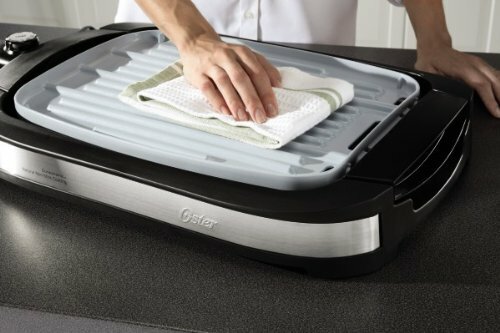 NON-STICK SURFACE WITH EASY CLEANUP : Non-stick surface means very little oil needs to be used. 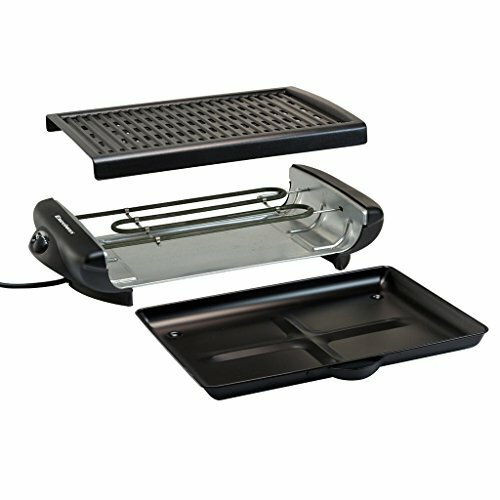 The ribbed grill surface with holes and oil drip tray keep the food free of fat and grease, meaning food cooked on the grill is healthier and retains its natural flavour. 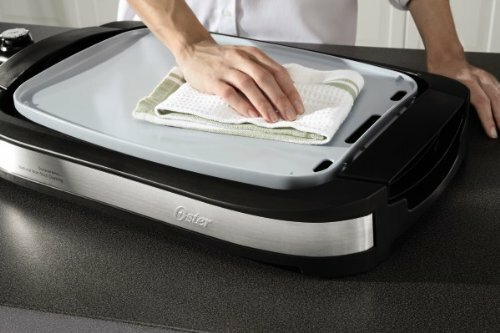 After grilling is complete, simply wipe the cooking surface clean. 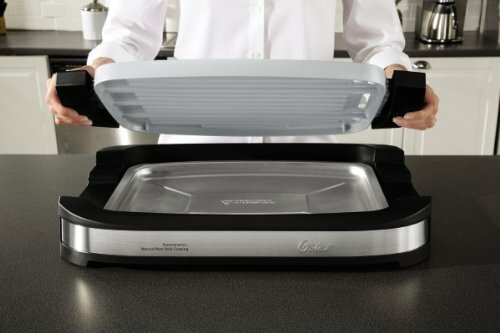 HEALTHY & APPLICATION : Cool-touch safe handles to keep your fingers from burning and base for low-fat, healthy cooking. ETL approved. 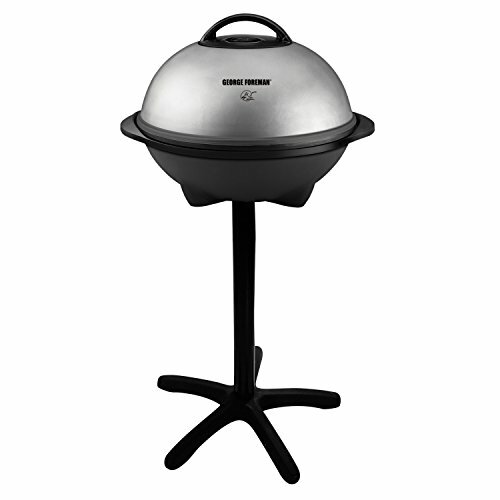 Ideal for grilling steaks, chicken, fish, burgers, and vegetables indoors. 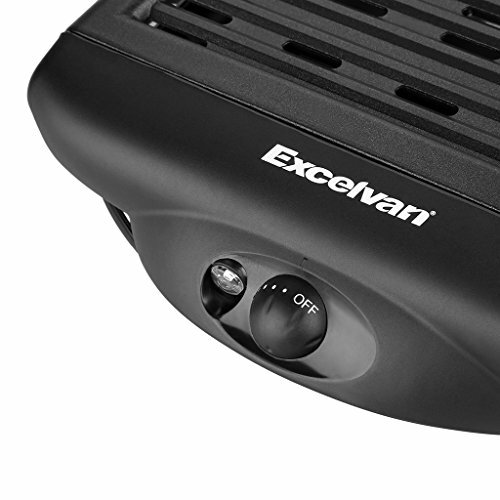 WARRANTY : Excelvan 20 x 10 x 4 Inch barbecue grills have 1 year warranty, 100% satisfaction and zero hassle returns guaranteed. 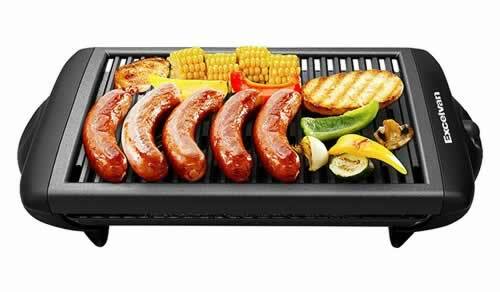 Enjoy time with your family and guest because this grill can be easily placed on the main table, have fun and grill at the same time. 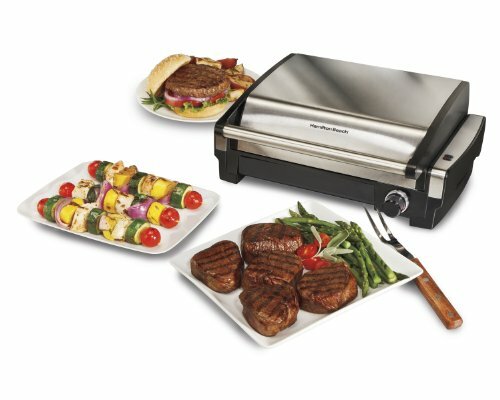 As warranties go, this grill comes with a 5-year limited warranty. 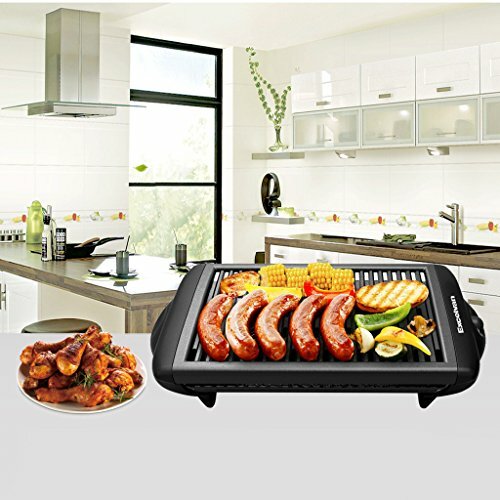 It features an 8-person traditional raclette with adjustable thermostat knob which allows the grill top to either keep appetizers warm on a low setting or turn up the thermostat and grill vegetables, chicken, sliced meats and fish. Use it indoor or outdoor with no fuss. 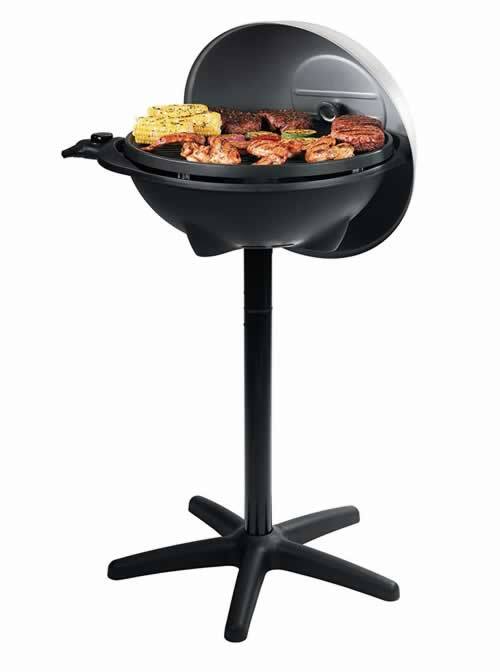 This grill can also be used either on a pedestal or on a tabletop. 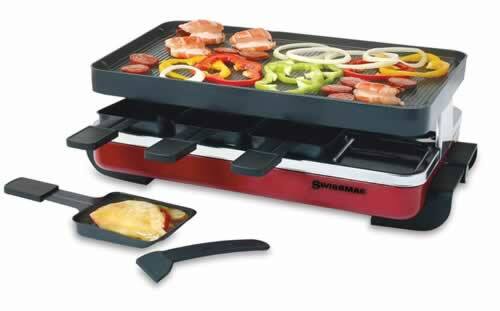 The 240 square inch cooking surface allows it to accommodate a large variety of food at the same time. The electric heat can be adjusted from a range of high to low. 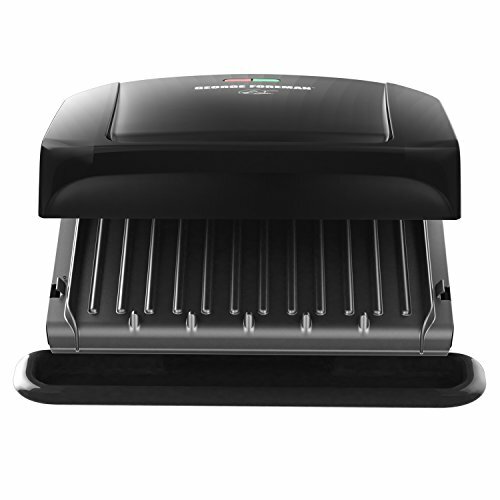 The non-stick grill surface not only allows you use a minimum of added fat, but it also makes cleaning a lot easier. It also has channels that collects accumulated fat or other liquids into an empty tray just below the surface. 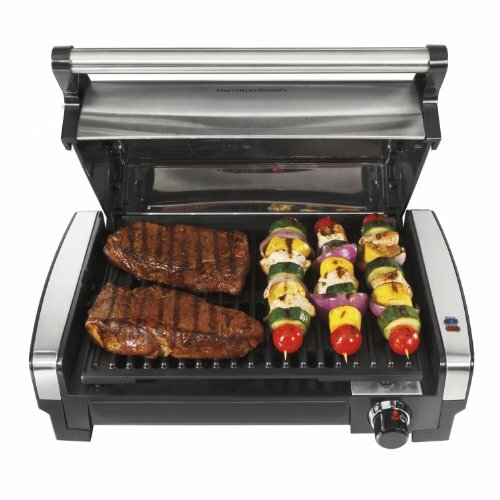 The Price: These grills come in various prices. If you plan on using it on a regular basis, then you should set out on buying the one with great features. Keep price in mind, but also be on the lookout for great features. 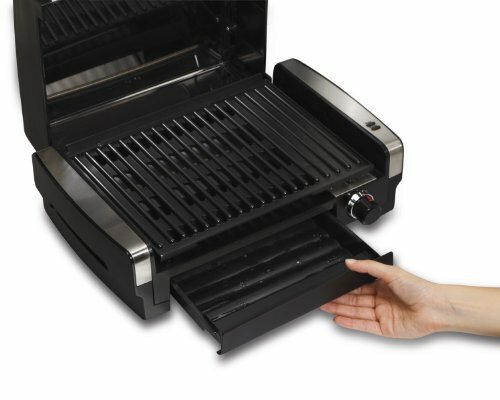 Best Features: Indoor grills come with a range of specs. 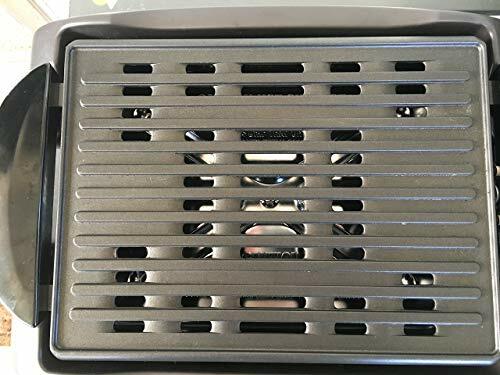 What you should be looking out for is the one that will generate enough heat to cook your food, easy to clean up and has enough space to occupy various food at the same time. 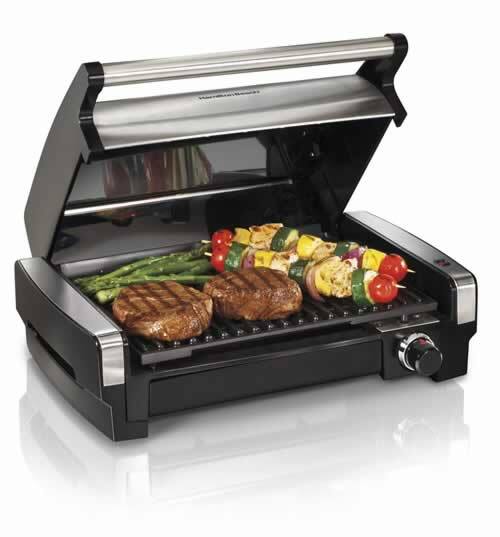 Choose Brand: A brand that has good reviews and ratings should be the one to consider when purchasing an indoor grill. The more positive reviews the more the chances of a great product. Return Policy: A defect caused by the manufacturer shouldnât be something you have to pay for. A warranty effectively covers you in such a scenario. It saves you the worry if something goes wrong. Why give up grilling because of the weather, insufficient backyard space or laws regulating outdoor cooking. With an indoor grill you can bypass of all of these problems. 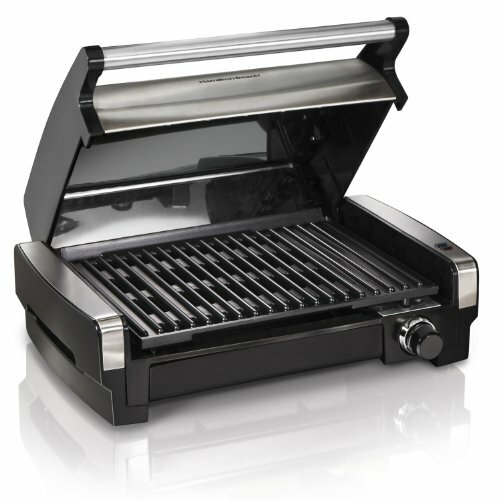 After reading through our review of the top 10 best electric grills on the market, you are now ready to get yours. Enjoy grilling anytime. 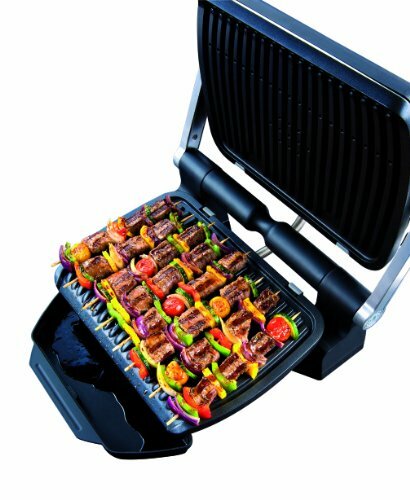 There are other types like the top-selling gas grills of 2019 that you may also like and consider. 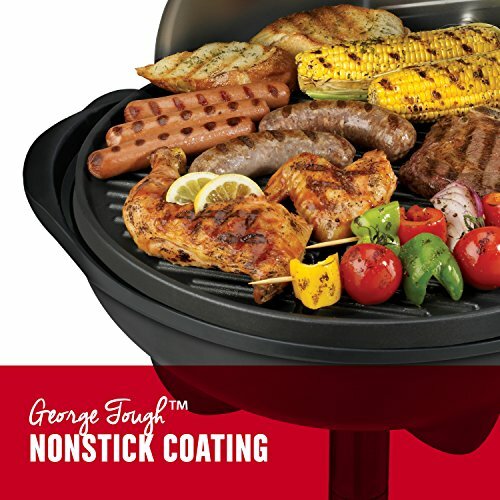 Check out all of the options and make your purchase soon to start grilling and enjoying.